Synopsis: ‘’How can Irene and Charles work together on their fifth grade poetry project? They don’t know each other . . . and they’re not sure they want to. Review: I was really excited to read this book after I heard how the authors wrote this book – by sending poetry back and forth over email. And what I really found interesting was that this book not only has two authors, but also has two illustrators, both who I admire for their mixed media and collage style. But, I’ll admit what really drew me to this book was the title. My partner has locs that reach all the way down his back to his waist and on more than one occasion he’s dealt with people walking up to him and touching his hair (very similarly to when people touch a pregnant woman’s belly) without asking. He’s an extrovert and journalist, so he’s able to take control of the situation pretty quickly, but I find it remarkable how invasive people feel they can be (especially complete strangers). Another example, my aunt has cerebral palsy and uses a wheelchair and is also nonverbal and even as young kid, I’d recognize the pointed stares of others kids while on vacation or just walking around the mall. I can remember once instance while on the metro in DC and my mom telling a child (who was staring) ‘’She has a disability which is why she can’t walk and uses a wheelchair to get around.‘’ I honestly don’t remember the child’s reaction, but in my head that was the best way to handle the situation – acknowledge the difference, explain the accommodation and move on. Granted, this acknowledgement can get old if it’s done over and over again during a person’s life, but that brings up the point of how else will a child learn? Parents and other adults in a child’s life can provide context for teaching kids about similarities and differences in the world and books are a great way to start a conversation. I think this is an amazing title to share with kids who want to learn more about people who are different from themselves. For a long time, parents have tried the approach , ‘’We don’t see color.’’ Well, people are different colors, different cultures, different abilities, etc. and if kids don’t have conversations with the adults in their world about these differences, how can we expect them to accept them and understand them? Most kids I know may have a few questions, but once they learn, they’re pretty accepting of differences. This was a really interesting book and one that is definitely geared toward the older elementary school and middle school student – one that would be a great book to share a poem or two to start a conversation and maybe a poetry project as well. For a long time, maybe as long as children’s books have been published in America, there has been an unspoken understanding amongst white parents that when it comes to race, the less said to children the better. White people are particularly attached to the notion that if you don’t mention race, don’t speak its name, don’t bring it up in any way with kids, then they’ll never notice race on their own and they’ll grow up to become wholly unprejudiced individuals, incapable of even a single racist thought. Right. This belief persists, flying in the face of studies that have shown that kids aren’t blind. One of the very first things they perceive growing up is difference. And if you don’t offer guidance of any sort to them as they age, then you’re allowing the world with all its messages and lessons to do the teaching for you. So children’s books find themselves at a crossroads. They can either continue as they have in the past, trading in specifics for hazy ’’we’re all the same inside’’ messages, or they can trod a new path. 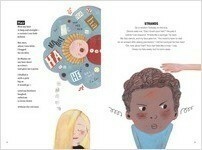 They can actually try their hand at confronting race head on in a format for the young. It took four people to bring us Can I Touch Your Hair? and countless others to bring it to our library and bookstore shelves. It takes only one person to buy it and show it to a kid. And it takes only one to use it as the conversation starter we’ve needed for so long. Pick a partner, says the teacher. Sounds so easy, but when Irene (who is white) ends up paired with Charles (who is black) she has no idea what to feel, except nervous. Irene’s quiet and Charles can talk a mile a minute. This is supposed to be a poetry assignment so the kids decide to pick topics they can both write about. You know. Shoes, hair, school, church, that kind of stuff. And at first their poems just reflect their differences. But as time goes on they see that they have so much more in common than they initially suspected. Lots of things are still unknown to them. ‘’Sometimes we say the wrong thing, sometimes we misunderstand. Now we listen, we ask questions.’’ Because you can’t know what you don’t know until you dig down deep. As I mentioned, the book was created by four people. Two wrote the words and two did the art. The Authors’ Note in the back of the book tells how Irene asked Charles to be a ‘’writing partner in a conversation about race’’ initially and how the book bloomed from there. There’s an Illustrators’ Note at the back as well, talking about how the book should ‘’ignite conversations about race and identity.’’ You’ve heard the old phrase about too many cooks in the kitchen, but in this case everyone involved appears to have had a role to play. This naturally led me to wonder if Irene and Selina wrote and illustrated the character of Irene while Charles and Sean separately tackled Charles the boy. I don’t think that’s how it played out in the end, but I can’t find any interviews here or online that clarify their process. I think in this case I’ll take a cue from something that does appear in the Illustrators’ Note where Sean and Selina waxed poetic over how, ‘’Mixing together materials mirrors our philosophy of mixing together our cultures.’’ Like any picture book, this one is words and pictures mixed together into a single cohesive whole. It’s art. Mixing is what you have to do. One challenge the authors faced with this book came in the creation of the characters of Irene and Charles. It’s so interesting that they decided to name the kids in the book after themselves. I wonder if it gave them, as writers, a connection to the material they couldn’t have found otherwise. 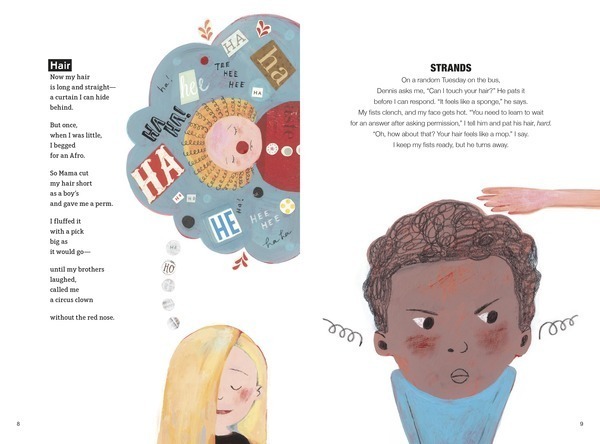 Certainly, for all that the book is written in verse, there is a depth to the kids and their lives you wouldn’t necessarily expect from poetry. Take Irene. She has a pretty good family, but even her dad is prone to outbursts of anger from time to time. Charles, for his part, is wrestling with complex issues he feels ill-equipped to handle. If cops hurt people that look like him, how does that gel with his understanding of one particular cop that he likes? I like that this book is perfectly willing to raise difficult questions without feeling a need to offer up some kind of easy answers. Sometimes a question has to remain a question to do its job right. Speaking of questions, you might legitimately ask about the book whether or not it quite lives up to its title. I think we can all agree that it’s one of the best titles of a work of poetry that we’ve seen in years. I was reminded of adult books like Phoebe Robinson’s You Can’t Touch My Hair: And Other Things I Still Have to Explain. So is this a version of Robinson’s book, just siphoned down to something appropriate for the elementary school set? Not exactly, but it is attempting to speak to the same underlying issues. Heck, if this book can prevent just one white kid from asking a black kid, “Can I touch your hair?” it may be worth the cover price alone. I admire this book deeply not least because there were a couple moments that made me, a grown woman, stop and think. One moment came when Irene saw the black girls playing freeze dance and wanted to join in. After a while one of the girls comes up to Irene and says, ’’You’ve got the whole rest of the playground . . . Can’t we at least have this corner?‘’ It put me in a mind to recollect a book by Beverly Daniel Tatum called Why Are All the Black Kids Sitting Together in the Cafeteria? 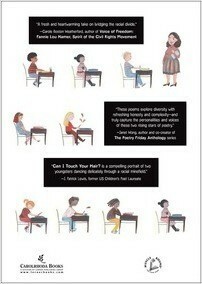 : And Other Conversations About Race. The thing that’s interesting to me about the line as it’s written is that the girl (Shonda) says ‘’at least’‘. She and her friends are making a space for themselves and who can blame them if they don’t want Irene barging in? The book makes Irene the sympathetic one in the scene, but I think there’s room here for a discussion with kids about whether or not Shonda and her friends are wrong to want a place where they don’t have to be ’’on’’. Later Irene and Shonda make up (and I’m not sure I buy how that comes about) but that early interaction stands out for me. For a long time the idea of writing a book about ’’diversity’’ was an exercise in being maudlin. Let me describe an average picture book for you. There is a kid. They are prejudiced in some way. Then with the help of a bunch of friends of different races, religions and/or abilities they are able to see that ’’we’re all the same under our skin’’. You’ve seen this book. You’ve probably seen loads of them, with some slight variations one way or another. What’s interesting to me is that books of this sort find safety in being vague on specifics. I’m a child of the 80s and I grew up with these books, so I saw them all the time. You know what I didn’t see? I never saw a single solitary book that took this message but applied it to black and white kids with the aim of showing the problems, the real problems, that kids are facing. I’m not saying these books don’t exist. They’re out there if you look for them (like the harrowing Whitewash by Ntozake Shange, for example). But a book like that, or like Can I Touch Your Hair? is a drop in the ocean when compared to the countless titles that want to promote difference without ever being different themselves. Given the chance, I suggest you try something a little bit different. Try this book. Just be prepared to answer some hard and necessary questions from kids along the way. Irene Latham is the author of more than a dozen current and forthcoming works of poetry, fiction, and picture books, including Can I Touch Your Hair? Poems of Race, Mistakes, and Friendship (co-written with Charles Waters). Winner of the 2016 ILA Lee Bennett Hopkins Promising Poet Award, she became obsessed with octopuses after reading The Soul of an Octopus by Sy Montgomery. Just like Agnes, she enjoys sending—and receiving—postcards. Visit her at www.irenelatham.com. Charles Waters is a children's poet, actor, and author. His poems have appeared in various anthologies including: One Minute Till Bedtime and The National Geographic Book of Animal Poetry. Charles performs his one-person show as well as conducts poetry performance and writing workshops for elementary and middle school audiences. He lives in New York City.